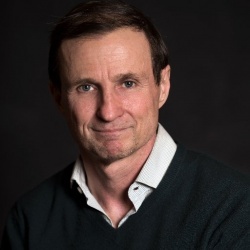 McKenzie (Ken) Wark (1961) is a writer and scholar. Wark is known for his writings on media theory, critical theory, new media, and the Situationist International. He is Professor of Culture and Media in Liberal Studies at The New School for Social Research & Eugene Lang College in New York City that he joined in 2003. Virtual Geography: Living with Global Media Events, Bloomington: Indiana University Press, 1994, PDF, IA, ARG. Celebrities, Culture and Cyberspace, Sydney: Pluto Press Australia, 1999; London: Commerford & Miller, 1999.
editor, with Josephine Bosma, et al., Read Me! ASCII Culture & The Revenge of Knowledge, New York: Autonomedia, 1999, 556 pp. 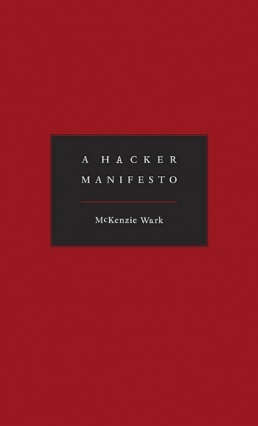 A Hacker Manifesto, 2004, Log. Gam3r 7h3ory, Institute for the Future of the Book, 2006ff. Gamer Theory, Harvard University Press, 2007, ARG. Telesthesia: Communication, Culture and Class, Cambridge: Polity, 2012. Chs 9, 13, 16, 19. The Spectacle of Disintegration: Situationist Passages out of the Twentieth Century, London: Verso, 2013.
with Rachel Law, W.A.N.T: Weaponized Adorables Negotiation Tactics, 2013, 80 pp. with Alexander R. Galloway and Eugene Thacker, Excommunication: Three Inquiries in Media and Mediation, University of Chicago Press, 2013. Molecular Red: Theory for the Anthropocene, London: Verso, 2015, xxiv+280 pp. editor, Molecular Red Reader, London: Verso, 2015, 85 pp. General Intellects: Twenty-One Thinkers for the Twenty First Century, London: Verso, 2017, viii+325 pp. Ray Edgar, Ashley Crawford (eds. ), Transit Lounge, Melbourne: Fine Art Publishing, 1998. Includes several of Wark's essays. "Blue Ruin: Totality and Acceleration", Rhizome, 10 Mar 2014. "The Vectoralist Class", e-flux Supercommunity, 29 Aug 2015. "Creators of the World Unite", Los Angeles Review of Books, 25 Nov 2015; repr. in LARB: The Digital Revolution: Debating the Promise and Perils of the Internet, Automation, and Algorithmic Lives in the Last Years of the Obama Administration, 2017, pp 63-68. Review of Cory Doctorow's Information Doesn’t Want to be Free. "Undeletable Text: Eric Hobsbawm", boundary 2 43:2, 2016, pp 125-140. "Friction", Public Seminar, 5 Sep 2016. On Anna Tsing. "Africa contra Hegel", Public Seminar, 24 Sep 2016. On Achille Mbembe. "Eduardo Viveiros de Castro: In and Against the Human", Verso Blog, 12 Jun 2017. "On Nick Land", Verso Blog, 20 Jun 2017. "Our Aesthetics", Verso Blog, 27 Jun 2017. On Sianne Ngui. "Kathy Acker: Get Rid of Meaning", The Brooklyn Rail, 5 Feb 2019. Texts on Verso Blog, 2011ff. "A Functional Form Has Its Own Beauty: An Interview with Kim Stanley Robinson", Los Angeles Review of Books, 1 Sep 2013. "Durable Futures and Intimate Encounters. McKenzie Wark with Thyrza Nichols Goodeve", The Brooklyn Rail, 8 Sep 2015. Alexander R. Galloway, "An Interview with McKenzie Wark", boundary2, 7 Apr 2017. Richard Marshall, "The Hacker", 3:AM Magazine, 10 Jun 2017. Anthropocene Lecture at HKW, Berlin, May 2017. This page was last modified on 17 February 2019, at 21:11.